GIBRALTAR ISLAND, Ohio — Through a new research project, a University of Toledo scientist believes he can show that reverse osmosis — a technology pioneered in the 1960s to take salt out of seawater — could likewise remove any algal toxins that get into tap water like they did for three days during the 2014 Toledo water crisis. While many experts believe in the premise outlined by G. Glenn Lipscomb, professor and chairman of UT’s chemical and environmental engineering department, the theory still needs to be tested for under-sink reverse osmosis systems people can buy from home improvement stores for about $250. If validated, the research could strengthen the market for those devices and give homeowners a chance for more peace of mind. “I guarantee you it will take out 99 percent of microcystin,” said Joseph Cotruvo, a former U.S. Environmental Protection Agency water division chief who spent years as an international water-treatment consultant and has been a member of a World Health Organization committee examining dangers of microcystin, Lake Erie’s chief algal toxin. Mr. Lipscomb’s research, part of a $1.9 million Ohio Department of Higher Education award split among eight Ohio universities, is supported by Ann Arbor-based NSF International, which specializes in science for testing standards at water-treatment plants. He said other partners include Dow Water & Process Solutions, a division of Dow Chemical, and the National University of Singapore, in collaboration with Singapore Public Utilities Board. Some of the world’s top water research occurs in water-stressed Singapore. During a recent presentation at Ohio State University’s Stone Laboratory on Gibraltar Island, near Put-in-Bay, Mr. Lipscomb said reverse osmosis technology came of age in the 1960s in parallel with desalination, the process by which salt is removed from seawater. The technology became much more fine-tuned about 1980, he said. Reverse osmosis is a process that goes against the natural tendencies that solvent, water-based molecules have to mix together and equalize. Instead, water is pushed hard — very hard — under pressure through a semi-permeable membrane so fine that it can filter out impurities down to the molecular level. The water on the other side that has been squeezed through the membrane is free of impurities. The theory is algal toxins could be removed like salt particles, minerals, and other solids. “It’s to provide the public with that certainty,” Mr. Lipscomb said of his research project. There are at least two downsides: Reverse osmosis is incredibly energy-intensive because of the amount of pressure required. And there can be as much or more wastewater generated as good water from the technique. In industrial uses, some minerals actually have to be added back in to stabilize water that has gone through a reverse osmosis treatment; otherwise, it would corrode pipes. For those reasons, experts such as Mr. Cotruvo, while highly interested in what Mr. Lipscomb finds out, wonder how practical it would be for average homeowners. Mr. Lipscomb said he doesn’t have a treatment system at his home. “There’s nothing wrong with Toledo water now,” he said. But he said his research offers promise if western Lake Erie’s chronic algae problem worsens, something which has happened in recent years. After 20 years with little or no algae, microcystis — one of the main producers of microcystin — began appearing annually in western Lake Erie again in 1995. Records show it has come on stronger since 2002, with a record bloom recorded in 2011. National Oceanic and Atmospheric Administration scientists were so confident that was the worst it would get they used that bloom as the end point for a predictive forecasting model they developed on a 1 to 10 scale, with 2011 being the 10. The 2015 bloom smashed that record, setting the bar higher. This year has been far different. Much like 2012, drought conditions have limited runoff and resulted in a lot less algae. But microcystis — one of Earth’s oldest-living organisms at 3.5 billions years old — has been on the rise globally the last 20 years for reasons scientists don’t fully understand. It wasn’t even Lake Erie’s dominant algae when the lake began to heal following passage of the federal Clean Water Act of 1972, which ushered in the modern era of sewage treatment. Many experts believe, though, that climate change and poor land use mean this region and others will be battling algae for years to come. A blue ribbon committee formed in response to the 2014 water crisis never priced the cost of installing reverse osmosis in Toledo’s aging Collins Park Water Treatment Plant because it didn’t seem to be a good match for the city, not just because of expenses but also because of the way that plant is designed, Andy McClure, Collins Park Water Treatment Plant superintendent, said. Instead, the city is spending millions of dollars to modernize and expand the plant in other ways. One of the cornerstones of that work, approved by the Ohio Environmental Protection Agency, is to use ozone treatment as a finishing process to remove more impurities while also improving taste and reducing odors. One of America’s largest water-treatment plants using reverse osmosis is a Southern California plant operated by the Orange County Water District, which processes 100 million gallons of water a day for nearly 850,000 Orange County residents. Other large ones are in Florida. Toledo processes up to 120 million gallons a day for about 500,000 metro area residents. By comparison, the world’s largest desalination plant is the Sorek plant in Israel, near Tel Aviv, which processes 150 million gallons a day. 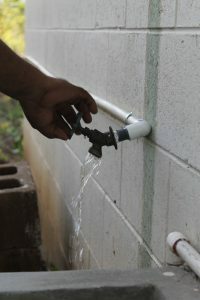 Bowling Green installed reverse osmosis system at its much smaller water-treatment plant in 2011. The Bowling Green plant — built in 1950 and expanded in 1968 — has an average capacity of 7.2 million gallons a day, but is rated to produce up to 11 million gallons a day. Mike Fields, assistant Bowling Green water superintendent, said reverse osmosis was installed to remove potentially dangerous chlorine byproducts known as trihalomethanes. Toledo removes its with a different process. He said it “takes a lot of electricity” to push water through the reverse osmosis system. For a facility as big as Toledo’s, ozone makes sense, Mr. Fields said. Mr. Lipscomb believes the future is in reverse osmosis, especially if costs and logistics can be worked out. “It’s like switching over from fossil fuels to renewables,” Mr. Lipscomb said. Contact Tom Henry at: thenry@theblade.com, 419-724-6079, or via Twitter @ecowriterohio. The National Science Foundation awarded $123,859 to a team of researchers at The University of Toledo to study the factors affecting the success and career choices of underrepresented minority engineering students. The two-year project will compare factors at UT and Alabama Agricultural and Mechanical University. The study will focus on the attitudes and beliefs of faculty and staff, existing institutional support mechanisms and the role of student organizations. The research will examine the effects these have on the social and academic integration of African American students. The National Science Foundation awarded a pair of engineering professors at The University of Toledo a $175,000 grant to design a program to manufacture micro-electro-mechanical systems on the Internet. Micro-electro-mechanical systems, called MEMS, have tiny moving parts and are used in cell phones, vehicle airbags and other consumer electronic products. For example, these devices are what cause the screen on a tablet or smartphone to rotate automatically from portrait view to landscape. Dr. Vijaya Kumar Devabhaktuni, professor in the Department of Electrical Engineering and Computer Science, and Dr. Daniel Georgiev, assistant professor in the Department of Electrical Engineering and Computer Science, will lead the project titled “CloudMEMS: Cybermanufacturing of Micro-Electro-Mechanical Systems” to develop a web-based, low-cost program to design micro-electro-mechanical systems, which will allow entrepreneurs and researchers to more efficiently prototype their designs. Devabhaktuni and Georgiev will collaborate on this project with Norfolk State University and the University of Dayton researchers who have been awarded $100,000 and $225,000. Overall, the National Science Foundation invested a total of $500,000 in this collaborative project. This three-year grant is one of five UT research projects to recently receive federal funds from the National Science Foundation totaling $375,000 in the fields of cybersecurity, advanced materials manufacturing, smart grid technology and three-dimensional cell culture. 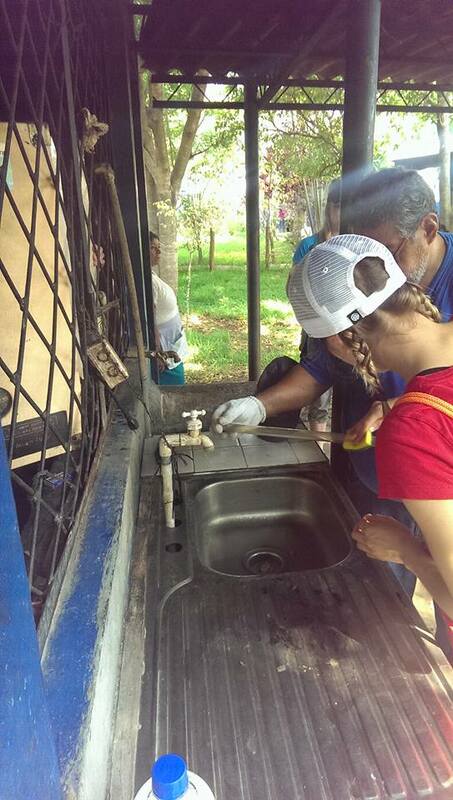 Four students from UT’s College of Engineering traveled with Professor Glenn Lipscomb to El Salvador May 14-20 to install a water treatment unit they built earlier in the year. Kylee Kramer, Alison Haas, and Lisa Young, Chemical Engineering majors, and Kayla Piezer, Environmental Engineering major, turned their freshman design project into a real-world solution. Students in the Chemical Engineering department’s fall 2015 orientation class manufactured water treatment units as part of their freshman design experience. They were also tasked with identifying possible improvements to their design and comparing it to alternatives. This design opportunity arose after another engineering student, Lucy Hosenfeld, approached the department about working with the non-profit Clean Water for the World (CWFTW) to produce the treatment units. 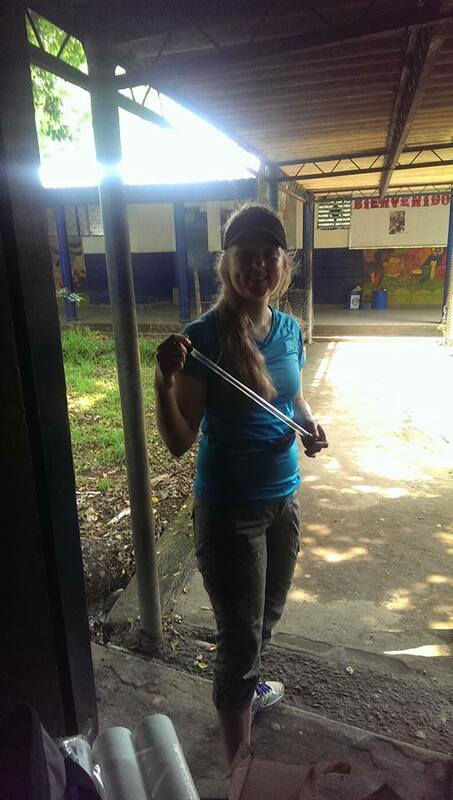 Lucy had worked with CWFTW and installed a treatment unit previously. Following the completion of their freshman design experience and orientation class, Kramer, Haas, Young, and Piezer sought funding for a trip to install their treatment unit in El Salvador, where contamination makes access to clean drinking water an increasingly urgent issue. 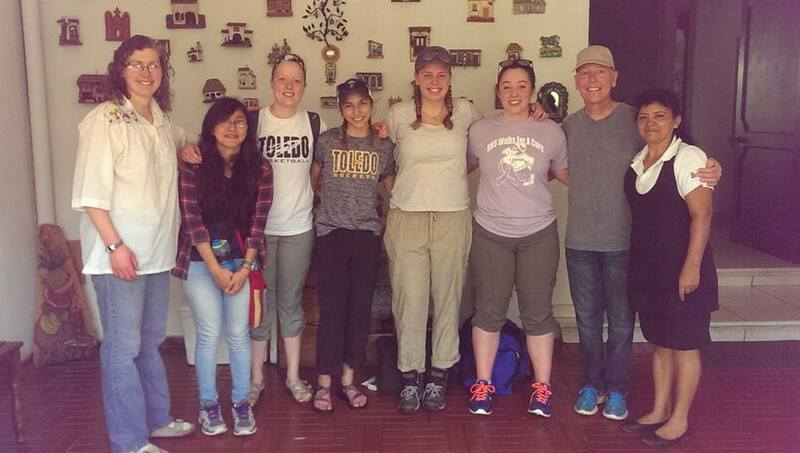 The students collaborated with the Centro de Intercambio y Solidaridad (CIS or Center for Exchange and Solidarity) to plan their trip, seeking donations from external donors and obtaining partial support from the University of Toledo. 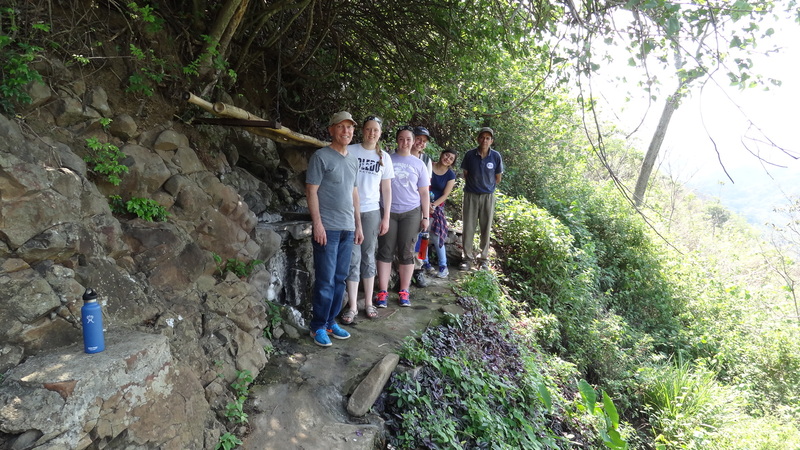 “This trip provided the real-world experience that is needed to understand the impact of engineering design on the adoption and use of technology to improve the human condition,” Dr. Lipscomb said. 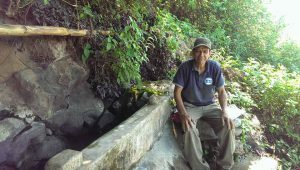 In El Salvador, contamination arises from inadequate waste water treatment facilities, especially in rural areas where the majority of the population lives. Addressing this water crisis, the students’ water treatment unit has two elements: a micron filter for removal of large particulate matter and a UV light chamber that sterilizes bacteria and other pathogens to prevent their proliferation and ability to cause illness. 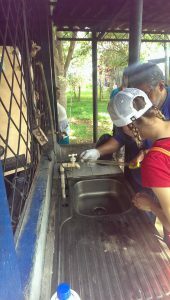 The team also inspected previously installed water treatment units over the course of their trip. 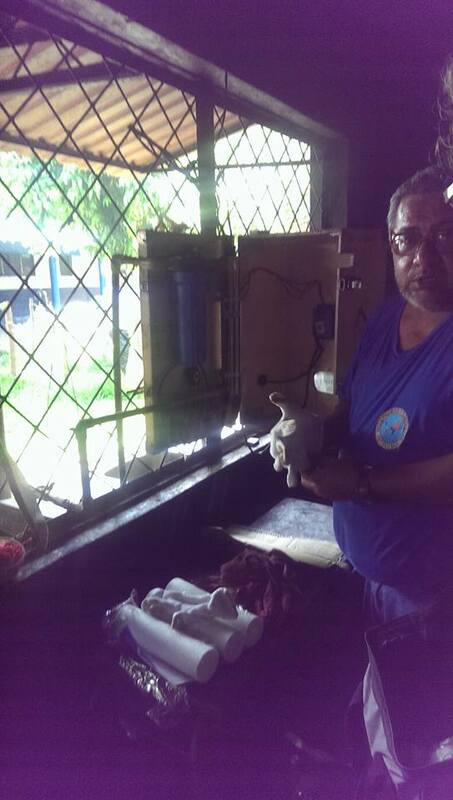 The team’s water purification unit. As part of the trip, the student team learned about CIS efforts to support local economic development, create businesses led by women, provide high school and university scholarships, and spread good hygiene practices. The team also spent time with local families in Comasagua. 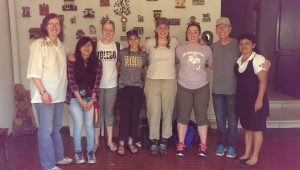 “It was incredible to expand our freshman design project to make a global impact while connecting with the community in El Salvador. 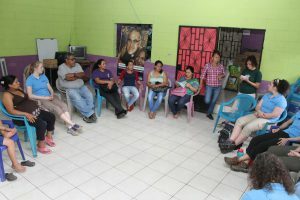 It gave us the opportunity to examine the specific needs of a different environment, which lead to an understanding of the community’s way of life and allowed us to build relationships on a personal level,” Piezer reported. Check out the team’s photo log below. 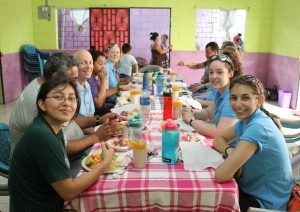 The Team arrives Los Pinos in San Salvador. 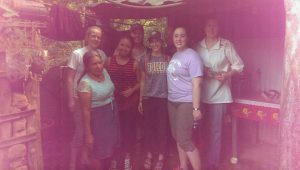 Evelyn, second from left, is our CIS guide. Tita, far right, is our wonderful house host. The Team visits a Corpus Christi scholarship recipient and her mother at their home. The team meets with residents in San Pablo Tacachico to talk with the local water committee about their needs. 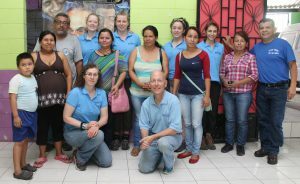 The San Pablo Tacachico water committee and the team pose for a photo. The local community provided lunch for the team in San Pablo Tacachico. 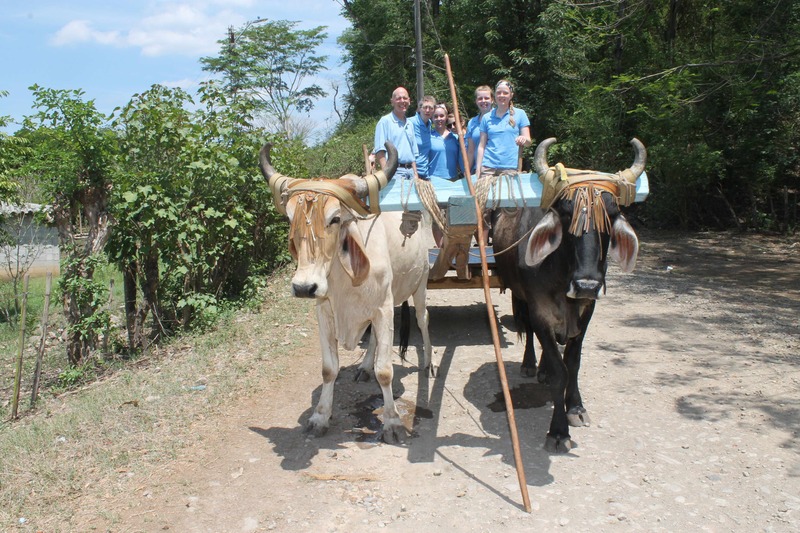 The team boards an oxen pulled cart during their visit to San Pablo Tacachico. 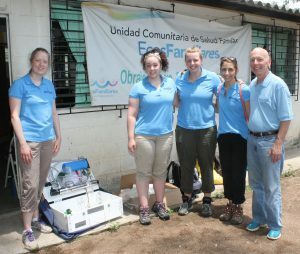 Left to right, Kayla Piezer, Lisa Young, Alison Haas, Kylee Kramer, and Glenn Lipscomb with the water purification unit that the students constructed in Toledo before installing it in the San Pablo Tacachico health clinic. Outside Comasagua, Victor shows us where he gets some of his water. It is a steep 10-15 minute hike from his house. The team visits a spring used in Comasagua for water. 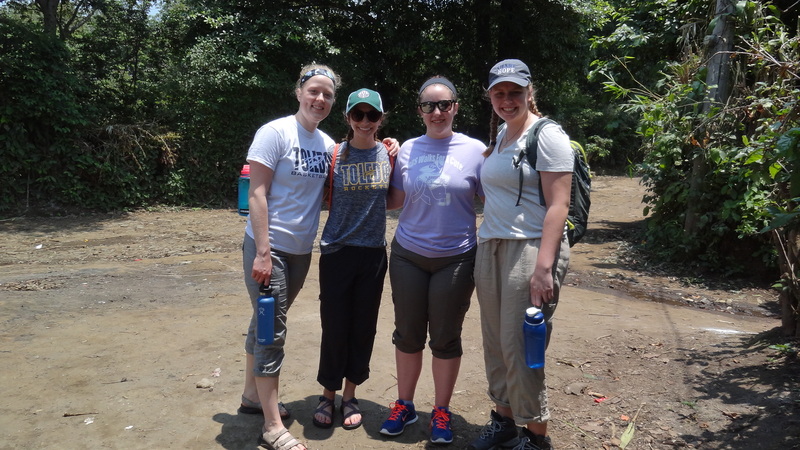 The students who built the purificationunit, left to right: Kayla Piezer, Kylee Kramer, Lisa Young, Alison Haas. Luis, the CIS expert, inspects the team’s unit. Kayla inspects the UV bulb. It appears in good shape. Kylee and Luis clean the glass housing for the UV bulb. Success! 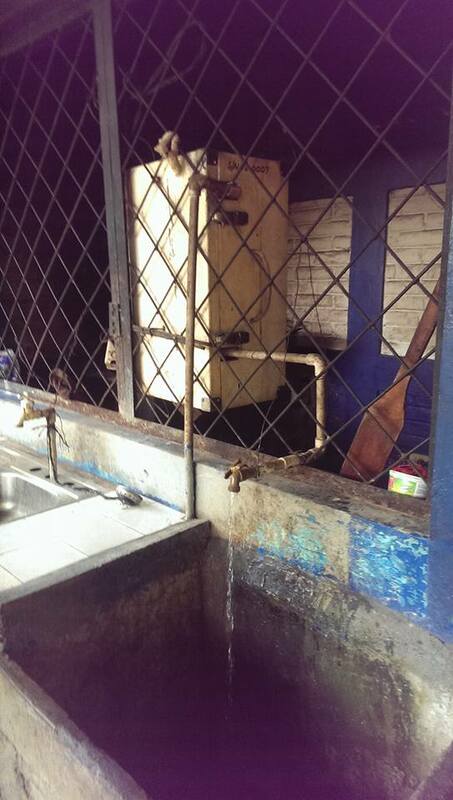 Water flows from the line installed by the students to provide 24/7 access to clean water from the water treatment unit in the San Pablo Tacachico health clinic.